Be the first to share your favorite memory, photo or story of Vatine. This memorial page is dedicated for family, friends and future generations to celebrate the life of their loved one. 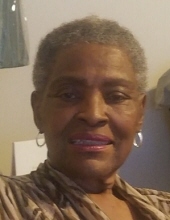 Mrs. Vatine Hammond Smith, 79, of Morrilton, Ar departed this life on Sunday, April 7, 2019. She was born January 11, 1940 in Springfield, AR to the late Sylvester and Katherine (Maxwell) Hammond. She graduated from Menifee High School in 1958. She retired from Levi Strauss after several years. She is preceded in death by one daughter, Frances Anita Smith; mother and father, Sylvester and Katherine Hammond; three brothers Arzmo Hammond, Sylvester Hammond Jr. and Howard Hammond and one sister Adilene Hammond. She leaves to cherish her memories: four daughters; Sharon Boyd of Little Rock, AR, Latonya Payne of Morrilton AR, Arlinda Blackwell EL of Conway, AR and Peggy Blackwell of Morrilton, AR; Six grandsons; Christopher Moore, Kenny Smith, Jymond English, Jordan Boyd, Tyler English and Javin Tolbert; Six granddaughters Kena Payne, Kayla Smith, Angelicia Polk, Lanessa Payne, Lonisha Abram and Ayann Bell; Eight great grandchildren; four sisters; Pauline Patton of Chicago, IL, Patricia Kemp of Damascus, AR, Louvenia (Louis) Terry of Little Rock, AR and Laura Hammond of Morrilton, AR; Two brothers Emil (Tina) Hammond of Little Rock, AR and Charles (Jamie) Hammond of Morrilton, AR; and a host of nieces, nephews, relatives and friends. Funeral services will be held 11:00 am, Saturday, April 13, 2019 at Light of the World COGIC, 601 Wall Street, Morrilton, AR. Visitation 6:00 pm - 7:00 pm, Friday, April 12, 2019 at the funeral home. Interment Bethlehem Cemetery in Sologachia, Arkansas. To send flowers or a remembrance gift to the family of Vatine Hammond Smith, please visit our Tribute Store. "Email Address" would like to share the life celebration of Vatine Hammond Smith. Click on the "link" to go to share a favorite memory or leave a condolence message for the family.